I'm sure you're all aware that as well as offering fragrances, Fragrance Direct also offer a range of beauty products with many brands appearing on the website at knock down prices. I heard a little rumour that Becca cosmetics had made an appearance on the site and indeed they have with some amazing savings like £29 off the Luminous Skin Color and £26 off the Compact Concealer. For some products there is a rather restricted range of shades available but I have to say I was quite impressed by the range of shades available for the concealer (I think I counted 30 in stock!). 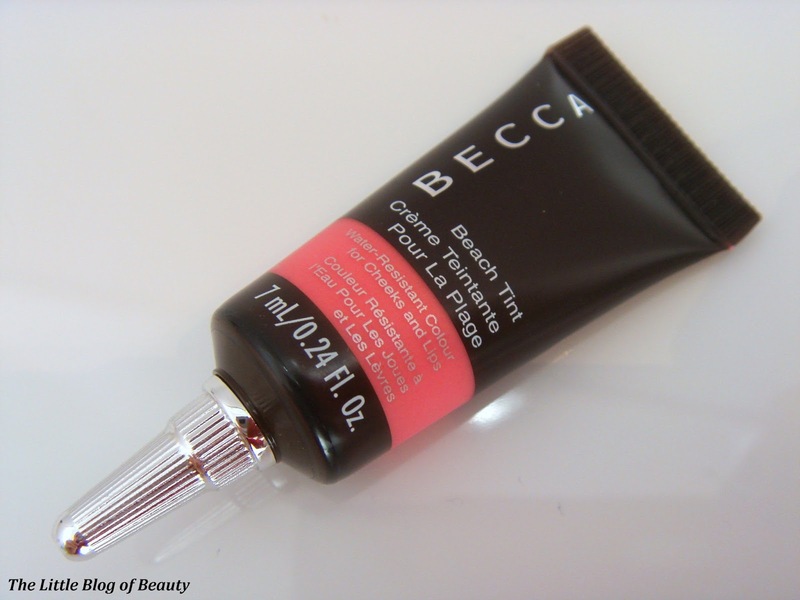 A few months back I was lucky enough to win one of London Beauty Queen's retweet competitions on Twitter and when I was having a browse of the products available I suddenly remembered that one of the amazing products Hayley sent to me was a Becca Beach Tint. So I headed to my stash to hunt it out so I could give it a try and write a review for my lovely readers in case you fancy treating yourself to one at the bargain price of just £3.99 (saving £16!). Although Lychee is not actually available on Fragrance Direct, and the only shade currently available is Strawberry, I find that they do get new stock in quite frequently, so do make sure you check back now and again to see if any new stock has come in. 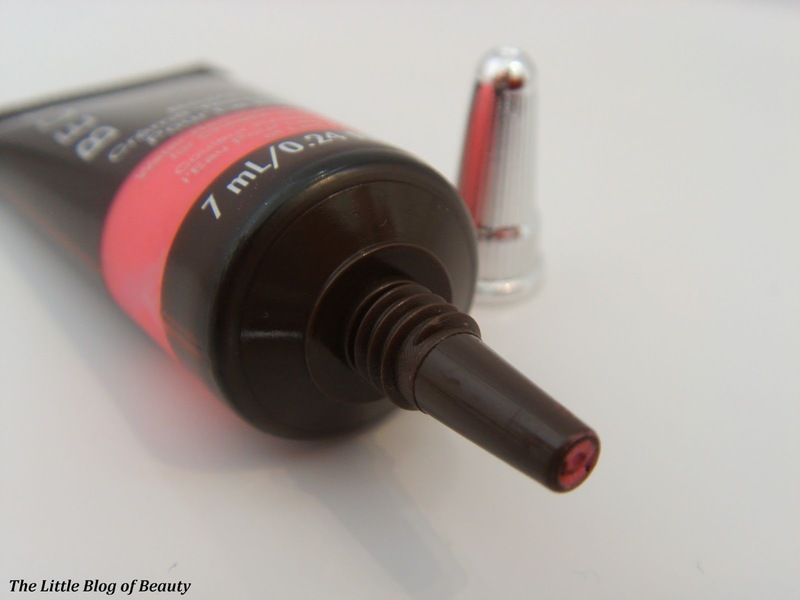 This comes in such a cute little squeezy tube with a thin nib to dispense the product. There's only 7ml of product in there but you need to use such a small amount that's more than enough to last you a long time. The first time I used this it had quite a solid consistency (I guess like a very thick, dry mousse) but then the second time I was taken by surprise when I gave the tube a little squeeze and it gushed out like a liquid. This has now settled down to somewhere between the two, a kind of thick liquid/light mousse, so I think some of the product closest to the end of the nib may have dried out while it wasn't being used. 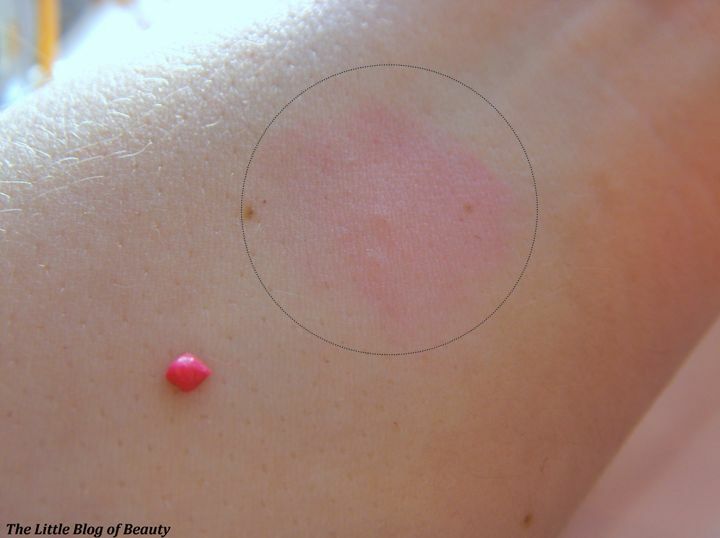 When this first comes out of the tube it really is quite a bright shocking pink colour (slightly darker than shows in the picture) but once blended it becomes more of a bright candy pink that does look just like your cheeks are naturally flushed. Obviously being such a bright colour you do have to be careful with how much you apply. When I popped this on a few days ago I was distracted by my boyfriend talking to me and when I looked in the mirror again I looked like somebody had slapped me! I find this lasts really well, although I haven't tested the claim that this is water resistant as I don't have a swimming poll handy (and it's far too cold for that anyway) and I just don't fancy splashing water on my made up face. Although this is called a Beach Tint, so I'm guessing that's where the waterproof claim comes in, I'm definitely not one for wearing makeup on the beach so this is irrelevant for me. Does anybody actually wear makeup on the beach? Although this is a cheek and lip tint I don't personally like using it as a lip product for two reasons. The first being that the formula is quite dry and I find that this really doesn't feel comfortable on my lips. The second reason is that although I find that bright fuchsia pink type lipsticks suit me, lighter baby or candy type pinks often don't, and this just doesn't look right one me. If you're a fan of quite dry matte formulas then you may like this as a lip product, but I would personally just stick to using it as a cheek product. Although I'm not sure I would pay the full price of £20 for this, for just £3.99 I think it's a bit of a bargain and would recommend giving one a try. 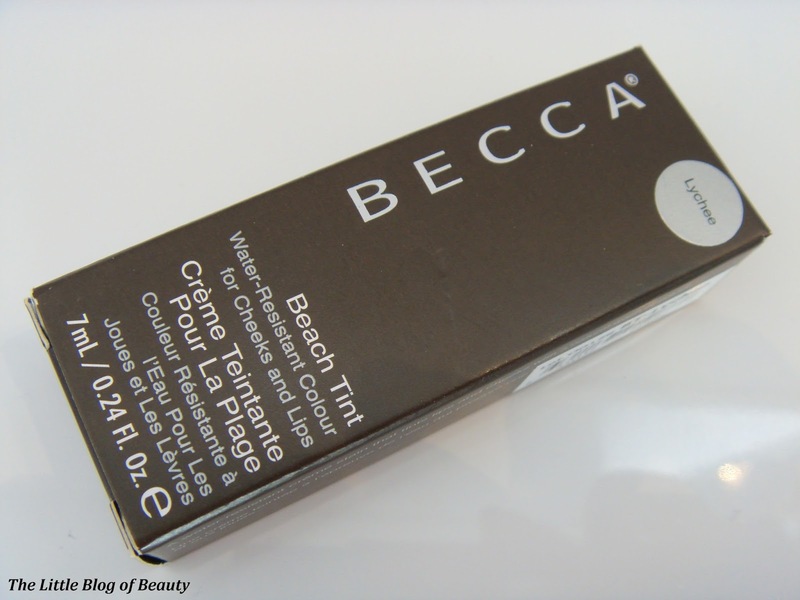 You can find the Becca Beach Tint on Fragrance Direct here. You got it for such a bargain price, looks lovely! I always wanted to try a Becca Beach Tint! They don't have the colours I'm after on Fragrance Direct though. Lychee looks gorgeous and a colour I would totally wear! I had a bit of a splurge on Fragrance Direct and was going to buy the shade Strawberry, although this shade looks much more up my street! I bought one of the eye tints and have the same feeling - wouldn't pay full price but at this price it's a bargain! p.s. thank you for sending you link over on the #bbloggers chat earlier in the week. I'm now a new follower!